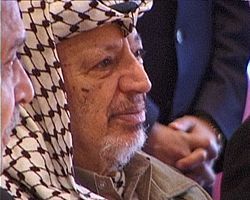 Yasser Arafat (Arabic: ياسر عرفات‎) (August 24 or August 4, 1929 – November 11, 2004) was born in Cairo to Palestinian parents. His given name was Mohammed Abdel-Raouf Arafat al-Qudwa al-Husseini (محمد عبد الرؤوف القدوة الحسيني). He was also known by the kunya Abu `Ammar (أبو عمّار). Arafat was chairman of the Palestine Liberation Organization (PLO) (1969–2004) and president of the Palestinian National Authority (PNA) (1993–2004). Arafat was a co-recipient of the 1994 Nobel Peace Prize alongside Shimon Peres and Yitzhak Rabin, for the successful negotiations resulting in the 1993 Oslo Accords. Arafat was a controversial and polarizing figure throughout his lengthy career. He was widely recognized for leading the Fatah, which he founded in 1957, as the movement that crystallized the dreams and aspirations of the Palestinian people into political action. His supporters viewed him as a heroic freedom fighter who symbolized the national aspirations of the Palestinian people. Many of his Israeli opponents regarded him as an unrepentant terrorist with a long legacy of promoting violence. Arab nationalists believe that he made too many concessions to the Israeli government during the Oslo Accords. Others accused him of being corrupt, or weak, or devious. Whatever his weaknesses, Arafat was a patriot from beginning to end who fought and sacrificed for the Palestinian dream of national self-determination. Mohammed Abdel-Raouf Arafat Al Qudwa al-Hussaeini was born on August 24, 1929 in Cairo. His father, a textile merchant, was a Palestinian with some Egyptian ancestry. His mother was from an old Palestinian family in Jerusalem. She died when Yasir, as he was called, was five years old. He was sent to live with his maternal uncle in Jerusalem, the capital of the British Mandate of Palestine. He has revealed little about his childhood. But one of his earliest memories is of British soldiers breaking into his uncle's house after midnight, beating members of the family and smashing furniture. In Jerusalem, he lived in a house near the Western Wall and the Al-Aqsa Mosque or Temple Mount, a site considered holy by Jews, Christians and Muslims. When he turned eight, his father married a second time and the family relocated back to Cairo. The marriage did not last. When his father married a third time, Arafat's sister Inam was left in charge of raising her siblings. Arafat attended the University of King Faud II (later renamed Cairo University). He later claimed to have sought a better understanding of Judaism and Zionism by engaging in discussions with Jews and reading publications by Theodor Herzl and other Zionists. But by 1946 he had become an Arab nationalist and was procuring weapons in Egypt to be smuggled into Palestine for the Arab cause. During the 1948-1849 Arab-Israeli war, Arafat left the university. Along with other Arabs, he sought to enter Palestine to attack Israeli troops in the name of Palestinian independence. He was disarmed and turned back by Egyptian military forces, who refused to allow him to enter the war zone. Arafat felt that he had been "betrayed by these [Arab] regimes." After returning to university, Arafat joined the Muslim Brotherhood and served as president of the Union of Palestinian Students from 1952 to 1956. By 1956, Arafat graduated with a bachelor's degree in civil engineering. He later served as a second lieutenant in the Egyptian Army during the Suez Crisis. Also in 1956, at a conference in Prague, he donned the keffiyeh, the traditional chequered head-dress which became his emblem. Arafat's younger brother Dr. Fathi Arafat is rumored to have founded the Arab Red Crescent and was involved in the humanitarian aspect of the conflict. Arafat founded one of the groups that became al-Fatah in Kuwait in 1959, with the help of friends Yahia Ghavani and Khalil al-Wazir (Abu Jihad), and a group of refugees from Gaza. FaTaH means conquest or victory (for the Palestine Liberation Movement). Fatah dedicated itself to the establishment of an independent Palestinian state. Arafat worked hard in Kuwait to establish the groundwork for Fatah's future financial support by enlisting contributions from the many Palestinians working there. They gave generously from their high salaries in the oil industry. In 1968 Fatah was the target of an Israeli Defense Force operation in the Jordanian village of Al-Karameh. One hundred fifty Palestinians and 29 Israeli soldiers were killed. Despite the high Arab death toll, Fatah considered themselves victorious because of the Israeli army's eventual withdrawal. The battle was covered in detail by Time magazine. Arafat's face appeared on the cover, bringing the wider world their first image of the man. Amid the post-war environment, the profiles of Arafat and Fatah were raised by this important turning point. Arafat came to be regarded as a cultural hero who dared confront Israel. Many young Palestinian Arabs joined the ranks of Fatah and equipment was improved. By the late 1960s, Fatah dominated the Palestinian Liberation Organization. On February 3, 1969, at the Palestinian National Congress in Cairo, Arafat was appointed leader of the PLO. He replaced Yahya Hammuda who had served as acting leader since Ahmad Shukeiri resigned in December 1967. Arafat became commander-in-chief of the Palestinian Revolutionary Forces two years later. In 1973 he became head of the PLO's political department. In the 1960s, tensions between Arabs from Palestine and the Jordanian government had greatly increased. Heavily armed Arab resistance elements (fedayeen) had created a virtual "state within a state" in Jordan, eventually controlling several strategic positions in Jordan, including the oil refinery near Az Zarq. Jordan considered this a growing threat to its sovereignty and security and attempted to disarm the militias. Open fighting erupted in June of 1970. Arafat was a threat to Jordan's ambitions in Palestine. Other Arab governments attempted to negotiate a peaceful resolution, but continuing fedayeen actions in Jordan (such as the destruction of three international airliners hijacked and held in Dawson's Field in Zarqa by the PFLP, on September 12) were used by the Jordanian government as a pretext to take action to regain control over its territory. On September 16, King Hussein I of Jordan declared martial law. On that same day, Arafat became supreme commander of the Palestine Liberation Army (PLA), the regular military force of the PLO. In the ensuing civil war, the PLO had the active support of Syria, which sent a force of around two hundred tanks into Jordan to aid them. Fighting was mainly between the Jordanian army and the PLA. The U.S. Navy dispatched the Sixth Fleet to the eastern Mediterranean Sea. Israel deployed troops to aid Hussein, if necessary. By September 24, the Jordanian army achieved dominance and the PLA agreed to a series of ceasefires. Following Black September and expulsion from Jordan, Arafat relocated the PLO to Lebanon. Because of Lebanon's weak central government, the PLO was able to operate virtually as an independent state. The PLO mounted intermittent cross-border attacks from Lebanon against Israeli targets, including civilians. In September 1972, the Black September group killed 11 Israeli athletes at the Munich Olympic Games. A number of sources, including Mohammed Daoud and Benny Morris, have stated that Black September was an arm of Fatah used for terrorist operations. The killings were internationally condemned. Arafat publicly disassociated himself and the PLO from the attacks. Meanwhile, Israeli prime minister Golda Meir authorized a campaign called Operation Wrath of God to bring down the Fatah cells operating in Europe. In 1973-1974, Arafat ordered the PLO to withdraw from acts of violence outside Israel, the West Bank and the Gaza Strip, because overseas attacks attracted too much bad publicity. The Fatah movement continued to launch attacks against Israeli civilians and security forces within the West Bank and Gaza Strip. In 1974 Arafat became the first representative of a nongovernmental organization to address a plenary session of the UN General Assembly. Arab heads of state recognized the PLO as "the sole legitimate spokesman of the Palestinian people." In his UN address, Arafat condemned Zionism, but said, "Today I have come bearing an olive branch and a freedom fighter's gun. Do not let the olive branch fall from my hand." His speech increased international support of the Palestinian cause. The PLO was admitted to full membership in the Arab League in 1976. In the late 1970s numerous leftist Palestinian organizations appeared and carried out attacks against civilian targets both within and outside of Israel. Israel claimed that Arafat was in ultimate control over these organizations and hence had not abandoned terrorism. Arafat denied responsibility for terrorist acts committed by these groups. The PLO played an important part in the Lebanese Civil War. After having taken control over West Beirut, and under siege by the Israeli army, Arafat declared Beirut to be the "second Stalingrad." Beirut ended up in ruins as a result of subsequent Israeli artillery and aerial bombardment. Close to 17,000 civilians were killed. During the Civil War, Arafat allied the PLO with Lebanese Muslim groups. However, fearing a loss of power, Syria's Hafez al-Assad switched sides, and sent his army to help the radical right-wing Christian Phalangists. The Civil War's first phase ended for Arafat with the siege and fall of the refugee camp of Tal al-Zaatar. Arafat narrowly escaped. His escape was assisted by the Saudis and Kuwaitis. During the Israeli siege of Beirut in 1982, the United States and European powers brokered a deal guaranteeing safe passage for Arafat and the PLO to exile in Tunis. Arafat actually returned to Lebanon a year after he was evicted from Beirut, this time establishing himself in Tripoli, Lebanon. Instead of being expelled by Israel, this time Arafat was expelled by a fellow Palestinian working for Hafez al-Assad. Arafat did not return to Lebanon personally after this second expulsion, though many Fatah fighters did. In September 1982, during the Israeli offensive into Lebanon, the United States and Europe brokered a ceasefire deal. Arafat and the PLO were allowed to leave Lebanon under the protection of a multinational force including eight hundred U.S. Marines supported by U.S. Navy landing craft. Arafat and his leadership eventually arrived in Tunisia, which remained his center of operations until 1993. Arafat narrowly survived an Israeli attack in 1985. In Operation Wooden Leg, Israeli Air Force F-15s bombed his headquarters in Tunis leaving 73 people dead; Arafat had gone out jogging that morning. During the 1980s, Arafat received assistance from Iraq and Saudi Arabia, which allowed him to reconstruct the badly battered PLO. This gave reinforcement to the PLO for the First Intifada (uprising) in December 1987. Although the intifada was a spontaneous uprising against Israeli occupation, within weeks Arafat was attempting to direct the revolt. Israelis believe that it was mainly because of Fatah forces in the West Bank that the civil unrest was able to continue as long as it did. On November 15, 1988, the PLO proclaimed the independent State of Palestine, a government-in-exile for the Palestinians which laid claim to all of Palestine as defined by the British Mandate of Palestine, rejecting the idea of partition. In a December 13, 1988 address, Arafat accepted UN Security Council Resolution 242, promised future recognition of Israel, and renounced "terrorism in all its forms, including state terrorism." Arafat's December 13 statement was encouraged by the U.S. administration, which insisted on the recognition of Israel as a necessary starting point in the Camp David peace negotiations. Arafat's statement indicated a shift from one of the PLO's primary aims—the destruction of Israel (as in the Palestinian National Covenant)—towards the establishment of two separate entities, an Israeli state within the 1949 armistice lines and an Arab state in the West Bank and the Gaza Strip. On April 2, 1989, Arafat was elected by the Central Council of the Palestine National Council (the governing body of the PLO) to be the president of the proclaimed State of Palestine. In 1990 Arafat married Suha Tawil, a Palestinian Orthodox Christian working for the PLO in Tunis, who converted to Islam before marrying him. During the 1991 Madrid Conference, Israel conducted open negotiations with the PLO for the first time. Prior to the Gulf War of 1991, Arafat opposed the U.S. attack on Iraq, which alienated many of the Arab states, and led the U.S. to doubt Arafat's claims of being a partner for peace. Arafat narrowly escaped death again on April 7, 1992, when his aircraft crash-landed in the Libyan desert during a sandstorm. The pilot and several passengers were killed. Arafat suffered several broken bones and other injuries. In the early 1990s Arafat engaged the Israelis in a series of secret talks and negotiations. The talks led to the 1993 Oslo Accords, which called for the implementation of Palestinian self rule in the West Bank and Gaza Strip over a five-year period. Prior to signing the accords, Arafat, as Chairman of the PLO and its official representative signed two letters renouncing violence and officially recognizing Israel on September 9, 1993. 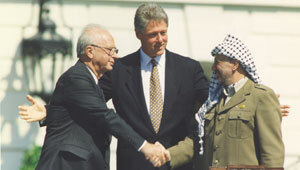 In return, Prime Minister Yitzhak Rabin, on behalf of Israel, officially recognized the PLO. The following year Arafat was awarded the Nobel Peace Prize along with Shimon Peres and Rabin. Arafat returned to Palestine as a hero to some but a traitor to others. In 1994, Arafat moved to the territory controlled by the Palestinian National Authority (PA)—the provisional entity created by the Oslo Accords. On July 24, 1995, Arafat's wife Suha gave birth to their daughter, who was named Zahwa after his deceased mother. On January 20, 1996, Arafat was elected president of the PA, with an overwhelming 88.2 percent majority. The only other candidate was Samiha Khalil. Independent international observers reported the elections were free and fair. However, because Hamas and other opposition movements chose not to participate in the presidential election, the choices were limited. The next elections, scheduled for January 2002 were postponed. The stated reason was the inability to campaign due to the emergency conditions imposed by the al-Aqsa intifada and Israel Defense Force incursions as well as the restrictions on freedom of movement in the West Bank and Gaza Strip. After 1996, Arafat's title as Palestinian Authority leader was "head" (Arabic Ra'ees of the Palestinian Authority). Israel and the U.S. interpret the title as "chairman" while Palestinians and the U.N. translate the title as "president." The mass media uses both terms. In mid-1996, Benjamin Netanyahu was elected prime minister of Israel by the narrowest of margins. Palestinian-Israeli relations grew more hostile as a consequence of continued conflict. Despite the Israel-PLO accord, Netanyahu opposed the idea of Palestinian statehood. In 1998, U.S. President Bill Clinton persuaded the two leaders to meet. The resulting Wye River Memorandum of October 23, 1998 detailed the steps to be taken by the Israeli government and Palestinian Authority to complete the peace process. Arafat continued negotiations with Netanyahu's successor, Ehud Barak, at the 2000 Camp David Summit. Barak was from the leftist Labor Party, whereas Netanyahu was from the rightist Likud Party. This change brought a change in the dynamics of negotiation; Clinton insisted on compromise. Consequently, Barak offered Arafat a Palestinian state including the majority of the West Bank and all of the Gaza Strip, with an outlying suburb of East Jerusalem as its capital. The final proposal proffered by Barak would have meant establishment of the Palestinian State on 90-91 percent of the West Bank and all of the Gaza Strip. Israel would annex the remaining 9-10 percent of the West Bank which encompassed large settlement blocs, in exchange for land in the Negev. In addition, under the Israeli proposal, Israel would retain some control of the Palestinian state's borders, customs and defense. Also included in the offer was a return of a small number of Palestinian refugees and compensation for the rest. Barak also stated he would willingly accept two capitals; a Palestinian-controlled Al Quds next to an Israeli Jerusalem. In a widely criticized move, Arafat rejected Barak's offer and refused to make a counter-offer. He may have calculated that the Palestinians were not prepared to acquiesce to the inadequate Israeli proposals regarding Jerusalem and the refugees. In spite of this, negotiations continued at Taba summit in January 2001. This time Barak pulled out of the talks to campaign in the Israeli elections. Throughout 2001 the Al-Aqsa Intifada, or Second Palestinian Intifada, grew in intensity. Following the election of Ariel Sharon, the peace process completely collapsed. Sharon, as Israel's newly elected prime minister, confined Arafat to the Moqataa headquarters in Ramallah. President George W. Bush claimed Arafat was "an obstacle to the peace." The European Union, on the other hand, opposed this tough stance. Following Arafat's death on November 11, 2004, Mahmoud Abbas won the January 2005 presidential elections and replaced Arafat as leader of the PA. Given the extremely dangerous nature of politics in the Middle East and the frequency of assassinations, Arafat's long personal and political survival was taken by most Western commentators as a sign of his mastery of asymmetric warfare and his skill as a tactician. Some believe his survival was largely due to Israel's fear that he could become a martyr for the Palestinian cause if he were to be assassinated or even arrested by Israel. Others believe that Israel kept Arafat alive because it came to fear Arafat less than Hamas and the other Islamist movements gaining support over Arafat's secular organization. The complex and fragile web of relations between the U.S., Israel, Saudi Arabia, and other Arab states also contributed to Arafat's longevity as Palestinian leader. Arafat's ability to adapt to new tactical and political situations, was exemplified amidst the rise of Hamas and Palestinian Islamic Jihad organizations. These Islamist groups espoused rejectionist opposition to Israel and employed new tactics such as suicide bombing, often intentionally targeting non-military targets, such as malls and movie theaters, to increase psychological damage. In the 1990s, these groups seemed to threaten Arafat's capacity to hold together a unified secular nationalist organization with a goal of statehood. They appeared to be out of Arafat's influence and control and were actively fighting with Arafat's Fatah group. Some allege that activities of these groups were tolerated by Arafat as a means of applying pressure on Israel. Some Israeli government officials opined in 2002 that the Fatah's faction Al-Aqsa Martyrs' Brigades began attacks on Israel to compete with Hamas. On May 6, 2002, the Israeli government released a report, based in part on documents captured during the Israeli occupation of Arafat's Ramallah headquarters, with copies of papers signed by Arafat authorizing funding for the Al-Aqsa Martyrs Brigades' activities. In March 2002, the Arab League made an offer to recognize Israel in exchange for Israeli retreat from all territories captured in the Six-Day War and statehood for Palestine and Arafat's Palestinian Authority. Supporters saw this offer as a historic opportunity for comprehensive peace in the region. Critics of the offer said that it would constitute a heavy blow to Israel's security, while not guaranteeing the cessation of suicide bombing attacks. Israel ignored this offer it deemed to be superficial. Shortly afterward, attacks carried out by Palestinian militants killed more than 135 Israeli civilians. Sharon, who had previously demanded that Arafat speak out strongly in Arabic against suicide bombings, declared that Arafat "assisted the terrorists and made himself an enemy of Israel and irrelevant to any peace negotiations." Israel then launched a major military offensive into the West Bank. Persistent attempts by the Israeli government to identify another Palestinian leader to represent the Palestinian people failed. Arafat was enjoying the support of groups that, given his own history, would normally have been quite wary of dealing with him or of supporting him. Marwan Barghouti emerged as a leader during the Al-Aqsa intifada but Israel had him arrested and sentenced to 4 life terms. Arafat was finally allowed to leave his compound on May 3, 2002 after intense negotiations. Six militants wanted by Israel, who had been holed up with Arafat, would not be turned over to Israel, or held in custody by the Palestinian Authority. Rather, a combination of British and American security personnel ensured that the wanted men remained imprisoned in Jericho. In addition, Arafat promised that he would issue a call in Arabic to the Palestinians to halt attacks on Israelis. Arafat was released. He issued the call on May 8, 2002, but it was largely ignored. Many feel this was because he secretly supported the attacks. This belief was widespread among all the Palestinian militant organizations who did not take Arafat's call seriously. On July 18, 2004, in an interview in Le Figaro, U.S. President George W. Bush dismissed Arafat as a negotiating partner: "The real problem is that there is no leadership that is able to say 'help us establish a state and we will fight terror and answer the needs of the Palestinians.'" This decision was criticized by the European Union and Russia, who were part of the quartet leading negotiations between Israel and the PLO. Arafat had, at best, a mixed relationship with the leaders of other Arab nations. However, he remained the most popular Arab leader among the general populace. For many years, was the only elected Arab leader. The most frequent criticism of Arafat by the Western and Israeli media was that he was corrupt to the detriment of the Palestinian people. Arafat's support from Arab leaders tended to increase whenever he was pressured by Israel. Combining all these different circumstances and Arafat's handling of them is like connecting puzzle pieces to see a larger picture. What appears is an understanding that Arafat was able to use and even manipulate situations to benefit not only his survival but also, the political ends that he envisioned. Unsubstantiated allegations of financial corruption surfaced beginning in 2002 in the Israeli and American media. In 2003 the International Monetary Fund (IMF) conducted an audit of the Palestinian Authority and stated that Arafat diverted US$900 million in public funds to a special bank account controlled by Arafat and the PA Chief Economic Financial Advisor. However, the IMF did not claim that there were any improprieties and it specifically stated that most of the funds have been used to invest in Palestinian assets, both internally and abroad. In 2003 a team of American accountants hired by Arafat's own finance ministry began examining Arafat's finances. The team claimed that part of the Palestinian leader's wealth was in a secret portfolio worth close to $1 billion; with investments in companies like a Coca-Cola bottling plant in Ramallah, a Tunisian cell phone company and venture capital funds in the U.S. and the Cayman Islands. Though Arafat himself had always lived modestly, Dennis Ross, former Middle East negotiator for presidents Bush and Bill Clinton stated that Arafat's "walking-around money" financed a vast patronage system known as neopatrimonialism. In other words, he used state funds to generate others' loyalty to himself and his agenda. Former members of Arafat's government accused Arafat of expropriating the wealth of the Palestinian people for himself. Salam Fayyad, a former World Bank official whom Arafat appointed finance minister in 2002, said that Arafat's commodity monopolies gouged his own people, "especially in Gaza which is poorer, which is something that is totally unacceptable and immoral." According to former cabinet member Hanan Ashrawi, "Getting Mr. Arafat to hand over the holdings was like pulling teeth. Mr. Arafat gave in to pressure from aid donors such as the European Union and from his finance minister, Salam Fayyad, the IMF's former representative in the territories. They demanded that Mr. Arafat turn over the investments as a condition of further aid." An investigation by the European Union into claims that EU funds were misused by the Palestinian Authority has found no evidence that funds were diverted to finance terrorist activities. The EU "remains convinced that deepening reform in the PA including improving its financial management and audit capacities is the best preventive strategy against the misuse of funds and corruption. The reform of the financial management of the PA is the objective of several key conditions attached to EU financial assistance." Yet Faud Shubaki, former financial aide to Arafat, reportedly told the Israeli Shin Bet that Arafat used several million dollars of aid money to buy weapons and support militant groups. Claims by unnamed sources in the PA Finance Ministry stated that Arafat's wife, Suha, receives a stipend of $100,000 each month from the PA budget. In an interview with the London based newspaper Al Hayat, Mrs. Arafat accused Israeli Prime Minister Ariel Sharon of spreading rumors about money laundering involving the transfer of funds to her in order to distract media attention away from corruption allegations he was facing. A 2003 probe by French prosecutors was inconclusive. First reports of Arafat's treatment by his doctors for what his spokesman said was 'flu' came on October 25, 2004 after he vomited during a meeting. His condition deteriorated in the days that followed. He became unconscious for ten minutes on October 27. Following visits by other doctors, including teams from Tunisia, Jordan, and Egypt, and agreement by Israel not to block his return, Arafat was taken on October 29 aboard a French government jet to the Percy Military Hospital in Clamart, near Paris. On November 3 he lapsed into a gradually deepening coma. Arafat's health was the subject of speculation, with suspicion that he was suffering from poisoning or AIDS. Speculations that Arafat was comatose, in a vegetative state or brain dead were hotly denied by Arafat's Jordanian doctor. More controversy erupted between officials of the Palestinian Authority and Arafat's wife Suha Arafat. Arafat was pronounced dead at 03:30 A.M. UTC on November 11 at age 75. The exact cause of his illness was never officially determined. After Arafat's death, the French Ministry of Defense said that Arafat's medical file would only be transmitted to his next of kin. Arafat's nephew, Nasser al-Kidwa, was determined a close enough relative, which worked around Suha Arafat's silence about her husband's illness. On November 22, Nasser al-Kidwa was given a copy of Arafat's 558-page medical file by the French Ministry of Defense. Arafat was a wily politician and dedicated patriot. His decades of leadership of the Palestinian Authority kept a precarious balance between legitimate advocacy for a Palestinian state and military maneuvers and tactics that may not have been easily traced back to him, but kept the sting on those who opposed his agenda. Through it all, he brought worldwide recognition to the national aspirations the Palestinian people and nearly succeeded in reaching that goal. ↑ 1.0 1.1 Irwin Abrams (ed. ), Yasser Arafat - Biography, Nobel Foundation. Retrieved July 26, 2007. ↑ Some sources use the term “chairman” rather than “president.” The Arabic word for both titles is the same. ↑ “Yasser Arafat: Homeland a dream for Palestinian Authority Chief,” CNNfyi.com. Retrieved July 26, 2007. ↑ MSN Encarta, Yasir Arafat. Retrieved July 26, 2007. ↑ Philip Mattar (ed. ), Encyclopedia Of The Palestinians: Biography of Khalil al-Wazir (Abu Jihad). Available online from PalestineRemembered.com. Retrieved July 26, 2007. ↑ J. K. Cooley, Green March, Black September: The story of the Palestinian Arabs (London: Frank Cass & Co., Ltd., 1973, ISBN 0714629871). ↑ Armed Conflict Events Database, Black September in Jordan 1970-1971, OnWar.com. Retrieved July 26, 2007. ↑ Yasser Arafat, Speech at UN General Assembly. Available online from Le Monde Diplomatique. Retrieved July 26, 2007. ↑ Profile: Suha Arafat, BBC News (November 11, 2004). Retrieved July 26, 2007. ↑ Profile: Binyamin Netanyahu BBC News (December 20, 2005). Retrieved July 26, 2007. ↑ “Hardliners gain ground in Likud vote,” BBC News (December 9, 2002). Retrieved July 26, 2007. ↑ On This Day: 28 September, BBC News. Retrieved July 26, 2007. ↑ The Media Line: The MidEast News Source. Subscription required. Retrieved July 26, 2007. ↑ Gideon Alon and Amira Hass, “MI chief: terror groups trying hard to pull off mega-attack,” Ha'aretz (August 14, 2002). Retrieved July 26, 2007. ↑ Steve Forbes, “Fact and Comment” Forbes (October 1, 2001). Retrieved July 26, 2007. ↑ “IMF audit reveals Arafat diverted $900 million to account under his personal control,” Electronic Intifada. Transcript of a Press Briefing on the West Bank and Gaza by Adam Bennett and Karim Nashashibi of the IMF's Middle Eastern Department with William Murray, Deputy Chief of Media Relations. Retrieved July 26, 2007. ↑ “Arafat's Billions: One Man's Quest To Track Down Unaccounted-For Public Funds,” CBS News. Retrieved July 26, 2007. ↑ Vernon Silver, [http://quote.bloomberg.com/apps/news?pid=nifea&&sid=ag2fQ5pMZXc8 “Arafat's Investments Included Dotcoms, New York Bowling Alley,” Bloomberg (December 21, 2004). Retrieved July 26, 2007. ↑ The EU & the Middle East: Position and background - Frequently Asked Questions, European Commission. Retrieved July 26, 2007. ↑ Yaakov Katz, "'Arafat used aid to buy weapons'" Jerusalem Post (May 17, 2006). Retrieved July 26, 2007. This page was last modified on 24 October 2016, at 16:28.